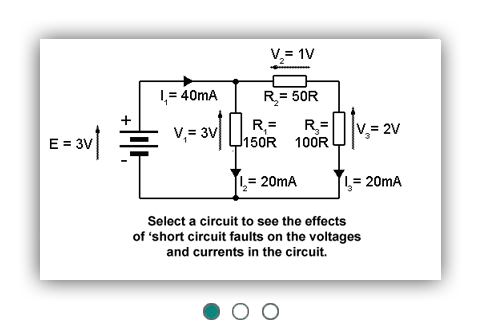 Describe the effects of short circuit components in basic resistive circuits. Diagnose short circuit component faults in resistive circuits using current and voltage measurements. 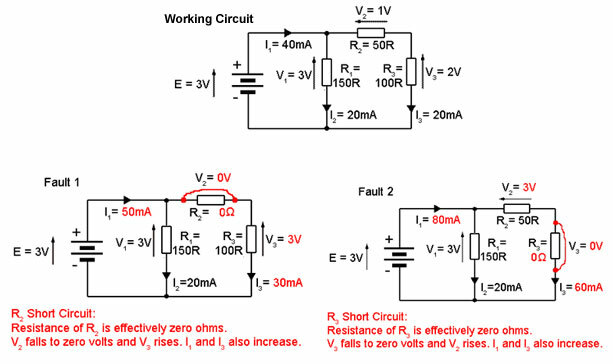 If two points in a circuit are connected by some component or conductor having a resistance of zero (or practically zero) ohms, the two points are said to be SHORT CIRCUITED or that there is a short circuit present. Under these conditions a larger current will flow, due to the reduction in resistance, and there will be NO (or almost no) potential difference between the ends of the short circuit. These conditions are illustrated below in Fig.4.4.1.